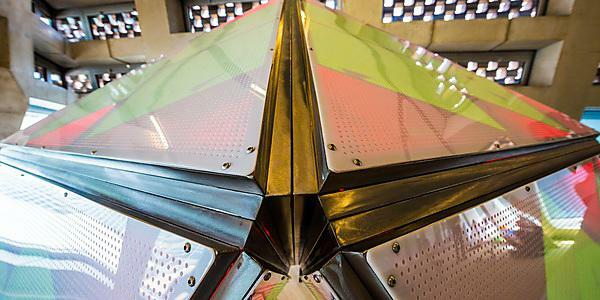 An immersive and interactive sculpture will offer visitors to the iconic new Tate Modern Switch House building a glimpse into the future of collectively living, working and being, with and through algorithms. This Is Where We Are (TIWWA) aims to reflect the changing nature of society through an algorithmic sculpture fuelled by the behaviour of those viewing it and its surrounding environment. It takes data from movement and touch, social media interactions and even temperature, energy consumption and CO2 levels, representing any shifts in climate and behaviour on its faces and panels. TIWWA has been created by i-DAT at Plymouth University and the Tate Collective, in partnership with Affinity with Plymouth University, InterCity, GaiaNova, Immersive, and TR2, and with funding from Arts Council England and Tate. It is among a number of high profile commissions produced specifically for the launch of the new Tate Modern Switch House building, which will be opened to the public for the first time for a three-day celebration starting on Friday 17 June. The piece has taking over the north east corner of the Tate Exchange in the new iconic venue, with tens of thousands expected to engage with it over the coming weekend. TIWWA is the latest project led by i-DAT, which has developed a global reputation for being at the forefront of experimentation with digital technologies, across art and research. 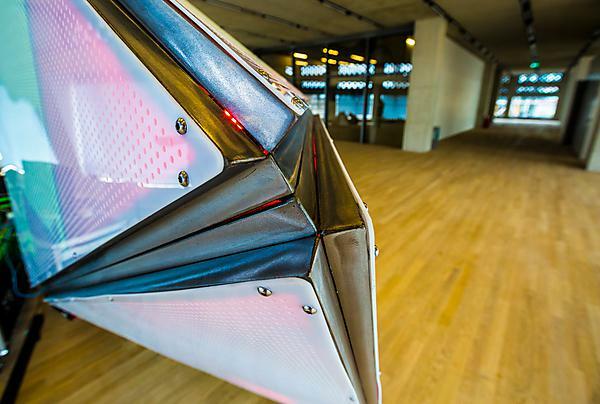 Measuring 5 metres by 3.5 metres, it incorporates the physical design and aesthetic of the new Switch House building, and has been designed through a collaboration between humans and algorithms. It incorporates robotic fragments, which are roaming chips of the larger algorithmic structure, and can distinguish between people, things and each other invites audiences to touch and play. TIWWA is the latest commission as part of i-DAT’s ongoing technology project, Quorum, which analyses and manifests physical, virtual and environmental data in a playful and engaging way. And because of the way it processes data, each person will receive an individual response tailored to their behaviour and interactions. The new Tate Modern will bring together much-loved works from the collection with new acquisitions made for the nation since Tate Modern first opened in 2000. With 60 per cent more display space, the world’s most popular gallery of modern art will now feature over 250 artists from around 50 countries. It will reveal how art has evolved from the studios and salons where modernism was born to the live, interactive and socially-engaged projects happening around the world today. Audiences can also chat and get to ‘know’ the TIWWA algorithm on the www.TIWWA.me and to follow updates on Twitter, visit www.twitter.com/tiwwa16. i-DAT’s underpinning research concerns are making ‘data’ generated by human, ecological, economic and societal activity tangible and readily available to the public, artists, engineers and scientists for artistic expression with a cultural and / or a social impact. It involves designing and constructing networked sensors and software platforms that focus on the significance that harvesting, processing and the manifestation of data can play in contemporary culture.